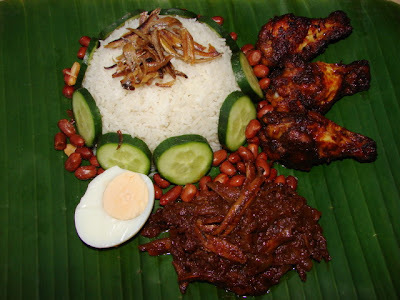 Nasi lemak is traditional Malay normally eaten for breakfast but many also eat this any other time of the day or night. Nasi lemak is usually sold by street vendors or in pasar (market) or tamu (open air market) all ready wrapped in banana leaf, paper or in polystyrene box. It is so popular some restaurants also sell this for lunch, afternoon tea or dinner. The word nasi lemak means rich rice. The richness comes from using coconut milk to cook the rice. The rice is usually fragrant with pandan leaf. Really delicious but not for slimmers. Nasi lemak is usually eaten with a sambal cooked with dried anchovies (ikan bilis). 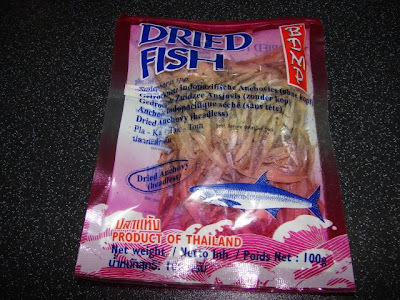 This dried and salted anchovies come from S E Asia are not the same as western anchovies. Sambal can use freshly ground rempah (mixed spice paste) or sambal tumis for convenience. Other accompaniments to go with nasi lemak include deep fried peanuts, deep fried anchovies, hard boiled egg/fried egg, cucumber and sometime a small amount of dried curry beef/chicken/prawn/squid or fried chicken. Since I got plenty of sambal tumis made not too long ago, I will use this save the work preparing and grinding fresh spices. If you don't have sambal tumis use few shallots, garlic, soaked dried chillies, fresh chilli, shrimp paste to make a spice paste then fry with oil before continue with the recipe below. Rinse rice, drain and remove excess water. Tie pandan leaves into a knot and put on the bottom of a deep casserole dish or rice cooker pot. Then add rice, water, coconut milk and salt. Stir to dissolve salt. Steam or cook in a rice cooker till cooked. Remove panda leaves. 100g of ikan bilis (dried anchovies), best use those already deboned. Rinse ikan bilis. Slice onion. Soak tamarind with 1/3 cup of boiling water, loosen with fingers then strain the juice. Cook onion with oil, add a pinch of salt and sugar, cook till onion is soften. Add ikan bilis, stir fry for couple of minutes. Then add sambal tumis tamarind juice, sugar and tomato paste. Stir and cook till the sambal thicken and oil started to split from the edge. Marinate chicken for few hours. Then either fry or grill till nice and brown. Deep fried some raw peanuts with skin till light golden brown. Then sprinkle with some salt. Alternatively can use ready to eat roasted peanuts. Deep fried some ikan bilis till golden brown and crispy. When everything is done. Arrange around a plate or on a banana leaf whichever way you like. If you like to make rice dome, spoon rice into a rice bowl, pack it down a bit with back of spoon then immediately invert and tip it out.